The 2017 Women in IT Networking at SC (WINS) Application is now closed. Selected candidates will receive full travel support and mentoring by well-known engineering experts in the research and education community. Created each year for the SC conference, SCinet brings to life a very high-capacity network that supports the revolutionary applications and experiments that are a hallmark of the SC conference. SCinet will link the convention center to research and commercial networks around the world. 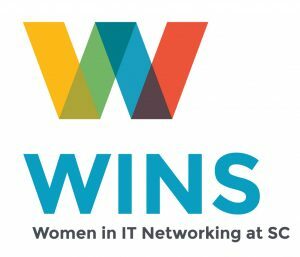 The WINS program is currently seeking qualified women U.S. candidates in their early to mid-career to join the SCinet volunteer workforce for SC17. Selected candidates will receive full travel support and mentoring by well-known engineering experts in the research and education community. SC is dedicated to supporting an inclusive environment. In 2015, SCinet partnered with a team of collaborators to create the pilot SCinet Diversity Program¹, developed as a means for addressing the prevalent gender gap that exists in Information Technology (IT), particularly in the fields of network engineering and high performance computing. The success of the 2015 program led to an official three-year award by the National Science Foundation (NSF) and DOE-ESnet, titled Women in IT Networking at SC (WINS)². WINS is a joint effort between the Energy Sciences Network (ESnet), the Keystone Initiative for Network Based Education and Research (KINBER), the University Corporation for Atmospheric Research (UCAR) and SCinet. SCinet provides an ideal “apprenticeship” opportunity for engineers and technologists looking for direct access to the most cutting-edge network hardware and software, while working side-by-side with the world’s leading network and software engineers, and the top network technology vendors. Participating in cybersecurity activities focused on prevention, detection, and countermeasures to protect the resources of the conference. For additional information on the WINS program, please visit the WINS website.